A year ago, I joked that the MIDA Multi-Tool was the only good gun in Destiny 2. That’s happily not the case anymore, and if you play enough you’ll actually get a variety of good guns with a variety of applications. However, for all the good stuff introduced in Forsaken, the best weapons from Destiny 2’s first year still remain dominant in year two. Most year-one gear has already been outclassed by Forsaken stuff, particularly year-one armour, because most of Destiny 2’s year-one gear only has a single perk. However, a few year-one weapons including most exotics, Warmind weapons, and Leviathan raid weapons, can still compete with year-two stuff. I’ve used the four weapons below in the majority of my Gambit matches, as well as for almost every encounter in the Last Wish raid, and they all held up beautifully. They may be year-one guns, but they’re as good as anything in year two. None of them are in the regular loot pool, so each one will require you to go out of your way to track them down. They’re worth taking the time. 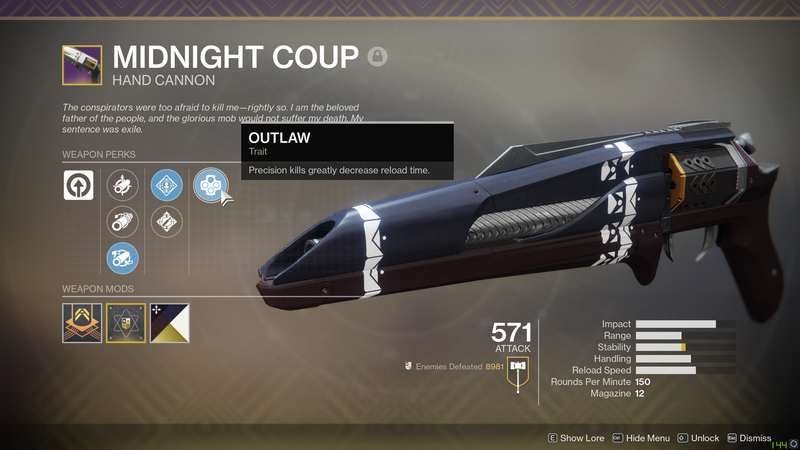 Why it’s good: The Midnight Coup hand cannon combines the top-tier rampage (stacking damage boost after a kill) and outlaw (faster reload after a precision kill) perks with a generous clip size, which makes it competitive with even the best randomly rolled year-two hand cannon. It’s been a mainstay for my Kinetic slot for most of my time with Forsaken, both in PvE and PvP. How to get it: The Coup drops from encounters in the year-one Leviathan raid. You’ll have to get lucky to an extent, but it has dropped with reasonable regularity since Bungie upped the number of drops per encounter. If you have Forsaken, you should be high enough level to make even the prestige version of last year’s raid pretty easy, though you do still have to get a group together to get it done. Why it’s good: The IKELOS Shotgun is one of the most tedious weapon chases in Destiny 2. 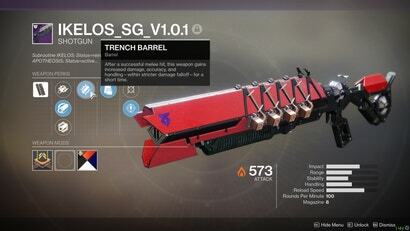 It’s a fast-firing shotgun that holds a lot of rounds in the tube, but what elevates it is its unique “Trench Barrel” perk. Punch an enemy before unloading and you’ll do significantly more damage, which makes melting bosses and ultras in PvE much easier. It’s not all that great in Crucible, but it’s indispensable in Gambit and high-level PvE activities like the raid. How To Get It: You’ll have to beat all seven levels of the Escalation Protocol (EP) event on Mars. The shotgun can drop from the boss of the seventh wave, though it’s important to note that it drops as an engram on the field. You do not have to open the chest to get it. The boss also won’t drop the shotgun every time you kill it, so you may have to repeat the sixth and seventh rounds a bunch of times before you get one. It’s a pain, but the gun is good enough that it’s worth it. 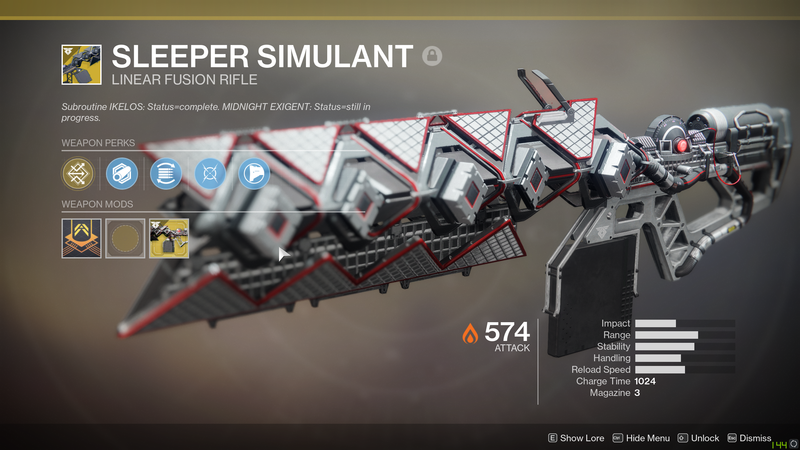 How to get it: Sleeper isn’t exactly hard to get, but it does take some grinding. It was part of the Warmind expansion, so the bulk of your activities will be on Mars. You’ll need to get an IKELOS hand cannon from Ana Bray, as well as the “Violent Intel” quest, which eventually leads to Sleeper. You’ll need to have an IKELOS weapon equipped for each step, so if you already have the IKELOS shotgun (or any other IKELOS weapon) from Escalation Protocol, you can use that instead of the hand cannon. The steps to get the gun are fairly straightforward, but you can check out this Eurogamer guide if you need specifics. Why it’s good: In addition to Sleeper, Whisper is the other must-have exotic power weapon in Destiny 2. It’s a sniper rifle that carries on the tradition of the Black Hammer and Black Spindle from Destiny 1, and can theoretically beat any other weapon in the game for damage output. That’s because of its “White Nail” perk, which magically refills the three-bullet magazine if you can land all three shots as critical hits. Crucially, it doesn’t fill the magazine from your reserves. It conjures the bullets out of thin air. That means that on certain bosses and raid encounters, you can have near-limitless damage output by firing shot after shot into a boss’s big crit zone. How to get it: Whisper is tricky to get, and you’ll need to find some friends to help you. It’s technically possible to solo the Whisper quest, but because of its time limit, it’s far easier to complete it with a team of three. Obtaining one is actually a really cool challenge, though, and worth doing just because it’s one of the neatest things in Destiny 2. The quest for Whisper is semi-hidden, and only opens up on Io on the weekends. It begins to appear on Friday and goes away at the weekly reset on Tuesday, which actually means it’s available more often than not. Head to the Lost Oasis on Io and wait for the Taken public event. Track down a big taken Ultra that will appear in a hidden corner of the area, often in a cave or somewhere else out of sight. Kill it, and a portal will open back in the middle of the zone. Head through, and you have 20 minutes to make it through a platforming gauntlet, to several rooms filled with tough enemies, to a final room with three bosses. 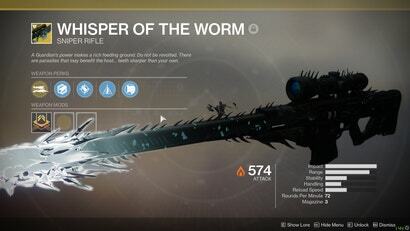 Kill the bosses before the time expires, and you’ll get the Whisper of the Worm. It’s pretty challenging to get this quest done before the timer runs out, even with the added power boost from Forsaken. You’ll probably need to work things out with your team ahead of time. It’s worth reading a detailed guide like this one over at Polygon, and you should plan your team’s loadout and super deployments in advance. I’ve helped a few friends through this quest post-Forsaken and it appears as though heavy ammo now basically (or entirely?) doesn’t drop during the encounter. That makes the final boss battle much more challenging if you’ve burned through your heavy in the preceding rooms. The key for my teams has been to have the people who’ve already done the quest equip Whisper and save their bullets for the boss room, hitting crits and replenishing their ammo as much as possible. That means it’s easiest to get this gun if you can get help from people who already have it, though even if no one in your fireteam has Whisper, it’s still a good idea to save all your heavy for the final boss chamber. Whisper is likely the least solo-friendly exotic quest in Destiny 2, but with a little dedication (and maybe the help of an LFG service), you can do it. And trust me, if you’re planning to take on the Last Wish raid, you’re going to want one. Those four weapons have formed the backbone of my loadouts for PvE and gambit, but there were plenty of other good guns introduced in Forsaken. In Crucible, pulse rifles are dominant, with Go Figure and Bygones topping many loadouts. 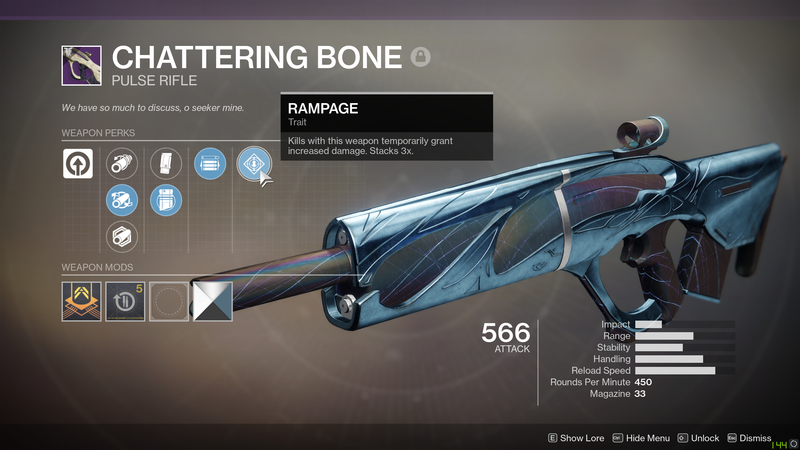 The new raid pulse rifle Chattering Bone is actually my favourite year-two pulse for PvP, with its crispy handling and fast fire-rate. 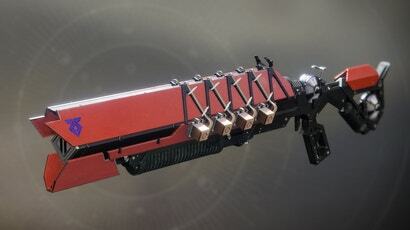 Ace of Spades is a very cool, very fun weapon that works great in PvP and PvE, and Bungie made it easier than ever to complete the quest to get it, so you should definitely do that. “Aggressive Frame” shotguns are also doing well in Crucible, and I like how many people are using the “crappy” blue shotgun Botheration Mk.28. I’ve also seen some convincing arguments in favour of using sidearms to counter the many jerks running around with shotguns. The extremely hard-to-get hand cannon Luna’s Howl sure seems good, not that I will ever have one. 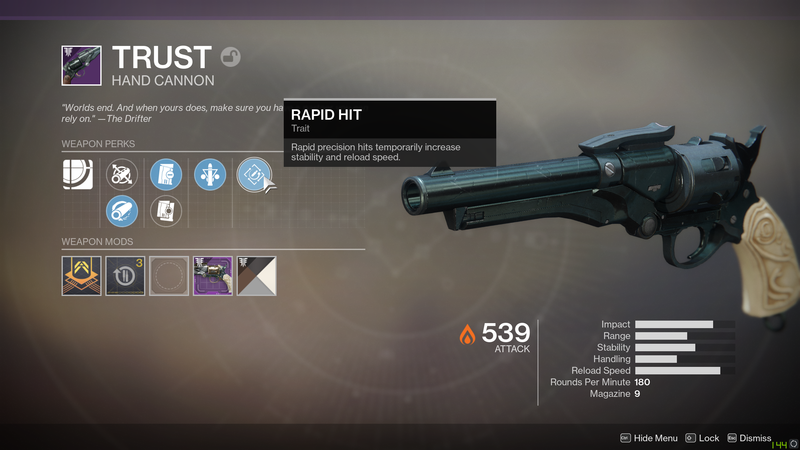 Some people also like the Gambit hand cannon Trust, though I haven’t yet gotten a roll I really love, and I also generally don’t love having a primary weapon in my energy slot. Grenade launchers are dominant in the PvP heavy slot, and I’ve definitely gone on my share of killing sprees with one of my many (many) versions of Play of the Game or Edge Transit that have dropped for me. I also like using Telesto in Crucible, but I have no real sense that any other fusion rifles are doing well in PvP. Same goes for sniper rifles, which seem like they’re in a weird spot due to the way special ammo drops in Crucible. Most PvP loadouts I’ve seen are, more or less, pulse/hand cannon in the kinetic slot, shotgun in the energy slot, and grenade launcher in the power slot. Many of those guns I just listed will drop over the course of regular play. 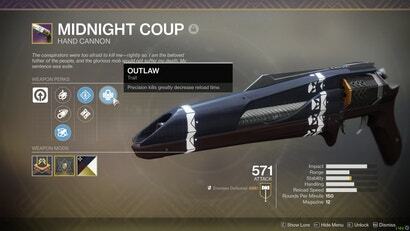 The four I listed above — Midnight Coup, the IKELOS Shotgun, Sleeper Simulant, and Whisper of the Worm — will require you to go out of your way to get them. They’re all worth the trouble, though, and work particularly well as a unified loadout. If you’re new to the game, or skipped year one, go hunt them down. 4 Weapons you should have if you dont have kids or a life. In saying that. My Claws of the wolf and Mida Multi Tool are holding their own in the Crucible. Crimson. Trust. Jade Rabbit. Arsenic Bite. Play of the Game. Who needs any other weapons. Bloody Sleeper Simulant. I stopped playing Gambit because I got sick of that weapon. Pulse rifles definitely seem like the go to weapon class in Crucible right now but I'm having fun with bow for a change.